Enjoy swimming, snorkeling, or whale watching on one of Maui's finest beaches. Our privately-owned, SIXTH FLOOR condominium (VRBO 21787) has magnificent ocean views. It has a High End Remodel and is truly a 'Home Away From Home' and a great Maui Vacation Rental. Kihei Akahi Resort Condominium is located in the southern part of Kihei, just off the edge of Wailea Resort Area. The grounds are meticulously maintained with blooming flowers everywhere and the private lanai is perfect for dining or watching the sunsets. Some of Maui's finest swimming beaches are in this area. Pictures of Kamaole Beach Park 2 are shown on our website. It is a soft sand beach, that gradually slopes out and is great for both swimming and snorkeling. The resort also features two pools and a free tennis court on the premises. Around the pools are barbecues and refrigerator for a convenient snack or drink while sunning. Golf is nearby, and many shops and restaurants are within walking distance. South Maui is a quiet and peaceful area, yet the 5 star hotels of Wailkea are just minutes away. WE PRIVATELY OWN: two one bedroom condos in the C building. They are units C-518 and C-604. In the D building we own D-504 which is a one bedroom condo, and D-602 which is a two bedroom condo. Check out our VRBO listing 2901 for details on C-518 and D-504. All of our units have been redone. They all have new kitchens, new baths with walk-in showers. new king size beds, air conditioning and free wireless internet. They all are elegantly furnished and well coordinated. Everything you need will be there, including beach towels and beach chairs. Most important - they are maintained with a very high level of CLEANLINESS. ALL of the feedback on our condos comes back that they were very clean. On our first visit to Maui, more than 20 years ago, we knew what everyone now knows: 'Maui No Ka Oi' 'Maui Is The Best' Within months of our Maui visit, we purchased a 'Piece Of Paradise', and have been returning several times a year ever since. We have a love of the islands and are 'True Hawaiians At Heart'. We love sitting on the lanai and wathching the sunsets. We also enjoy taking long walks on the beach and visiting some of the local restaurants for lunch and dinner. Kihei is a great locatation for golf and snorkeling activities. Kihei Akahi Resort is located in South Maui, just off the edge of Wailea Resort area. This area is noted for some of Maui's finest beaches. Wonderful Ocean Views Plus a view of Sunrise over Mt Haleakala. there are 2 elevators . Beautiful condo with great views of Haleakala and the ocean. C604 is a beautifully updated condo with a well equipped kitchen to cook some dinners and breakfasts to enjoy on the lanai watching the ocean and the breathtaking sunsets. Seeing a whale was always a bonus! Walking distance to all shopping, restaurants as well as the beach was very nice. Thank you Joan for making our 2019 Maui vacation a success. We can’t wait to come back! Beautiful well cared for condo. We enjoyed our stay here, the condo is beautiful and very well maintained with a great ocean view, fantastic kitchen and comfortable king size bed, would definitely stay here again. The owner is very professional and easy to communicate with. The condo had everything you needed, truly a "home away from home". The complex was lovely and the beach was right across the street. Another great trip to Maui for us, and of course we can't wait to come back! Very well maintained property and we only had one problem and it was with the shower and was fixed almost immediately. Great appliances and really appreciated the tile floors and even a safe to lock up valuables. It was very quiet and also appreciated the beach chairs and umbrella! We both said we would definitely love to come back to this property and found it close to a great beach, shopping and restaurants! It was may dream condo away from home. Thank You for taking the time to review Kihei Akahi C-604. We try hard to create an environment that is a "Home Away From Home" for our guests. This environment results in many repeat guests and we hope you will be one in the future. We enjoyed Joan's condo very much! 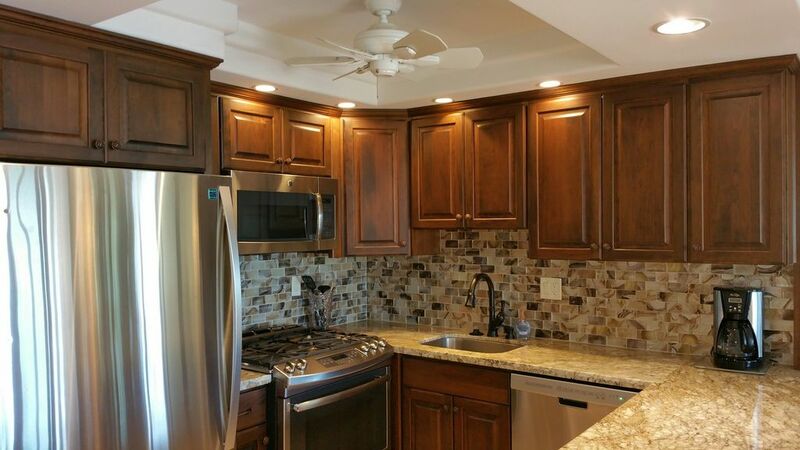 It is spacious and is beautifully remodeled, especially the kitchen. The kitchen is also very well supplied with dished and cooking utensils, pots, and serving containers. The lanai has a lovely ocean and mountain view. We enjoyed eating some meals there. The many screens allow the breezes to cool the condo beautifully. However, when it was hot, we appreciated the air conditioning in the bedroom at night.. Many extras are provided such as beach towels,a CD to play on the road to Hana, a lovely book about Maui and even beach shoes. I am so happy that you had a chance to fully enjoy your vacation in C-604 and catch your return flight before the Hurricane arrived. South Maui lucked out because there was no damage at all from the Hurricane. It was a pleasure meeting both of you and hearing about your snorkeling adventures. Thank You for taking the time to write this review. The Perfect Condo for a Perfect Vacation! I would give this place a 100% rating. The condo was exactly as the pictures depicted it and has a great view of the ocean from the balcony. Getting to the place was easy, parking was great, and the condo was spotless. The bed was comfortable and the newly renovated kitchen was amazing. The extras in the condo like beach towels, beach chairs, coolers with ice packs, and non perishable spices and condiments made our stay relaxing and convenient. Joan (the owner) was great to deal with and always answered any e-mail quickly. The condo management was excellent and extremely helpful. The condo complex itself was breathtaking with a awesome garden area, two pools, and tennis courts. There was even an outside shower to wash off sand from the beach. There was a crosswalk right in front of the condo which led to one of your favourite beaches on Maui. That beach was also a perfect place to watch the sunset. Definitely choose this place if you are going to Maui!